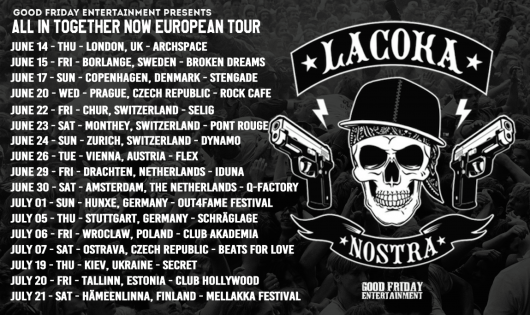 LCN is finishing out the year in Europe! Check out where ILL BILL, Danny Boy, Slaine and DJ Eclipse will be performing in Europe. Click the links below to purchase tickets for your city. 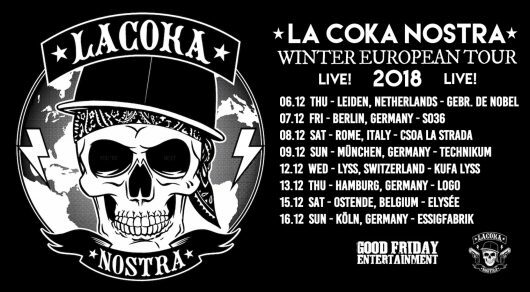 La Coka Nostra is coming back to Europe! 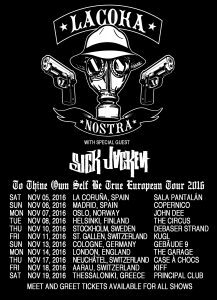 Check out where Slaine, ILL BILL, Danny Boy and DJ Eclipse will be performing in Europe. Click the links below to purchase tickets for your city. 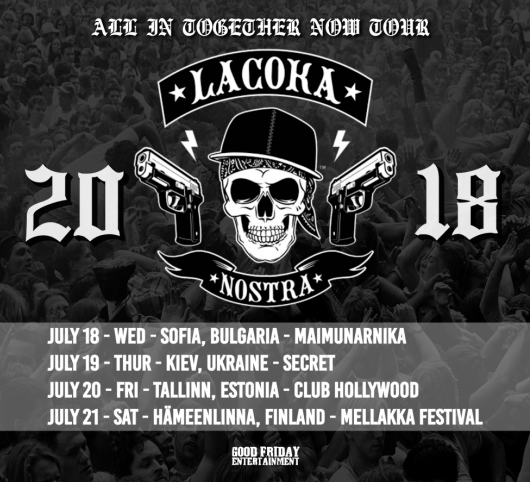 La Coka Nostra hits Europe! Check out where Slaine, ILL BILL, Danny Boy and DJ Eclipse will be performing in Europe. Click the links below to purchase tickets for your city. 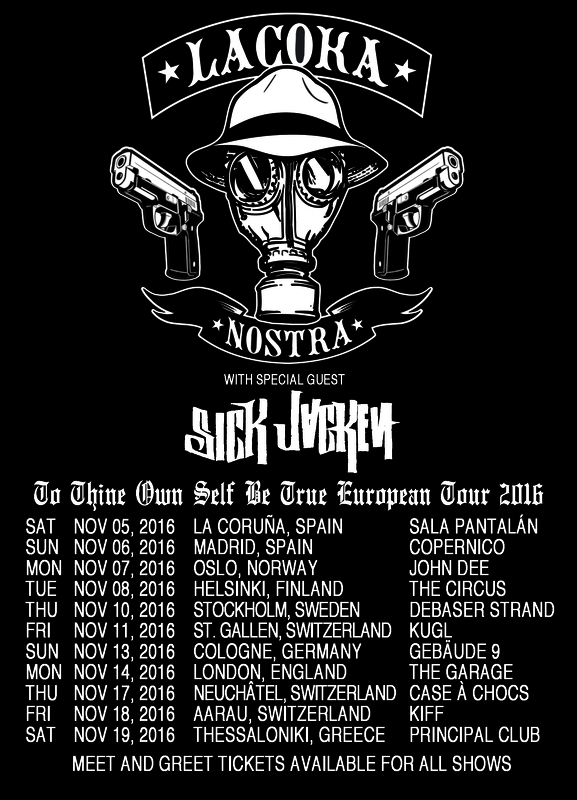 La Coka Nostra is touring Europe this fall season to perform songs from their latest album, To Thine Own Self Be True. The album releases worldwide this week (11/4/2016) and features production from J57, The Arcitype, DJ Lethal, Statik Selektah, Marco Polo, Leaf Dog, and more. Along with members Slaine, ILL BILL, and Danny Boy, guest appearances include Rite Hook, Nems, Q-Unique, Vinnie Paz, Apathy, Sick Jacken, and more. Purchase To Thine Own Self Be True on iTunes or buy a physical copy on fatbeats.com. Check out the tour dates below and don’t miss out! One of Hip Hop’s greatest super groups is about to drop their latest album, To Thine Own Self Be True, on November 4, 2016. The visuals for their second single “Waging War” have been released. The song is produced by The Arcitype and features Rite Hook on the hook. Additional album information and tracklist have already been announced. 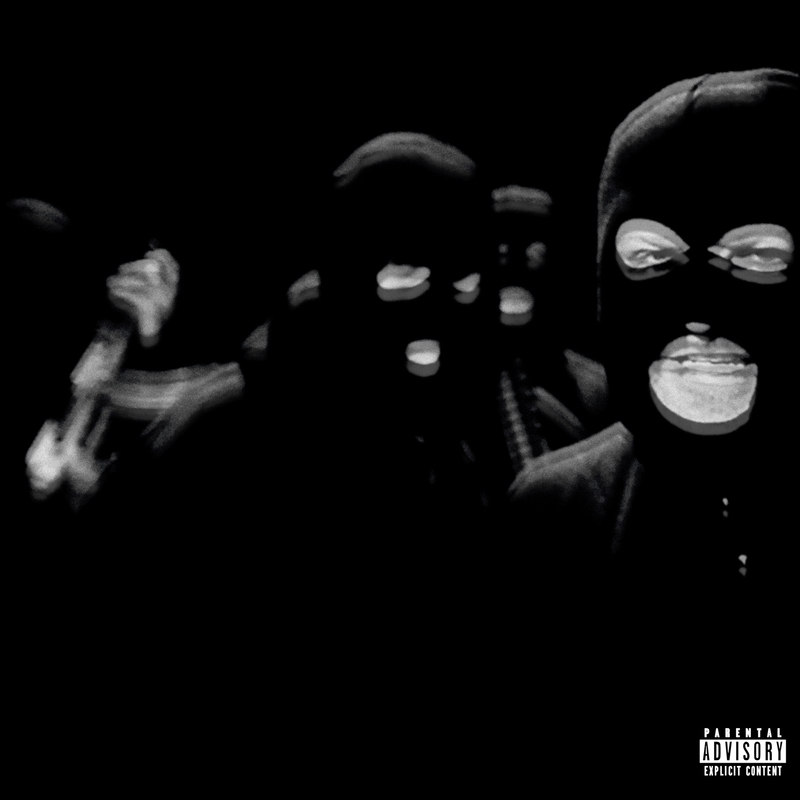 Pre-order La Coka Nostra’s album To Thine Own Self Be True from the options below. 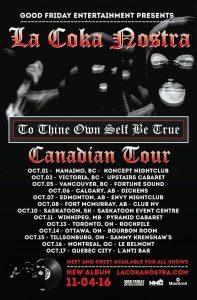 La Coka Nostra is taking over Cananda through the month of October! 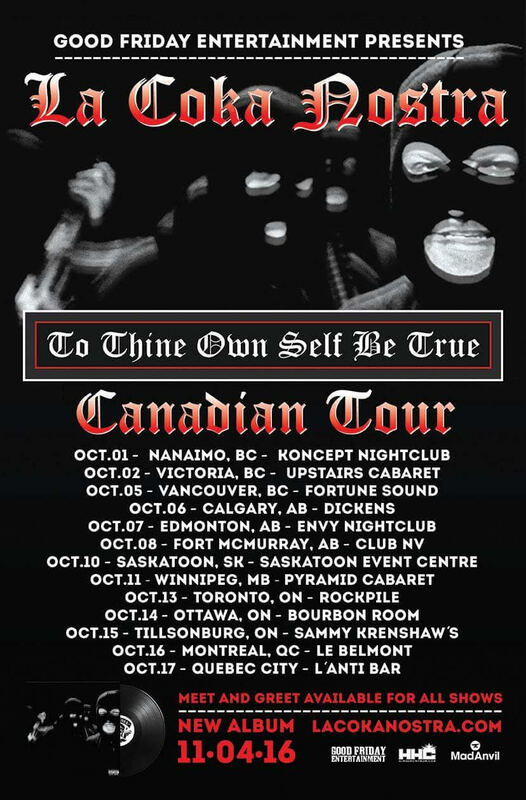 With their new album To Thine Own Self Be True scheduled to release on November 4, 2016, Slaine, ILL BILL, and Danny Boy will showcase their new material as well as some of the classic songs that fans have loved them for. 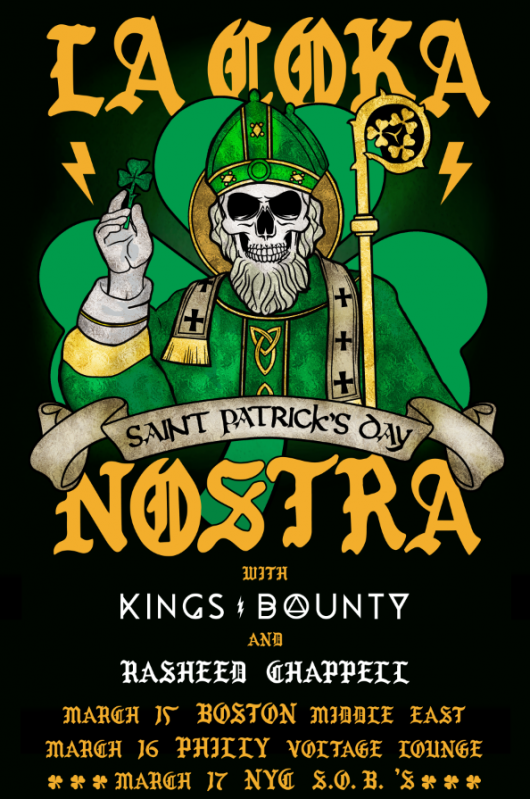 La Coka Nostra will host meet and greets for each show, so make sure to show up early. Purchase tickets at the respective venue web sites below. Hailed as one of Complex’s 21 Greatest Hip Hop Supergroups of All Time, La Coka Nostra is back with their next album, To Thine Own Self Be True. Available on November 4, 2016 on Fat Beats Records, Danny Boy, Slaine, and ILL BILL have teamed up with an all-star lineup of producers and guest appearances. Featured emcees include Sick Jacken, Rite Hook, Q-Unique, Vinnie Paz, Nems, Apathy, and more. Producers on the album include J57, The Arcitype, DJ Lethal, Statik Selektah, Marco Polo, Salam Wreck, and more. The lead single “Stay True” was released on September 15, produced by Statik Selektah. The full track list has been released and listed below, as well as the single “Stay True”. Check it out! Check out Non Phixion this summer in the northeast! The popular Hip Hop crew is getting together to perform some of their classic songs from the 2000s. If you’re within a few hours driving distance, you won’t want to miss these shows! Purchase tickets below. 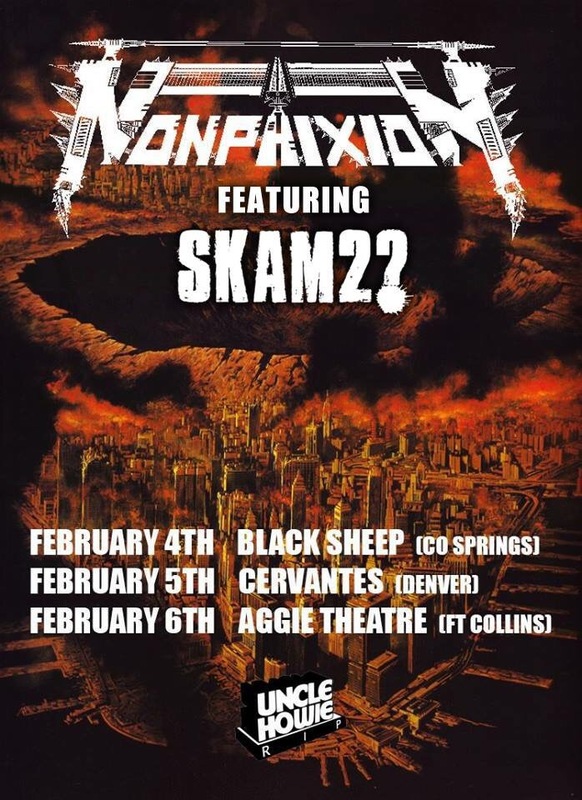 Non Phixion 2016 Colorado Tour with SKAM2? In 2016, Non Phixion is starting off the year with a February tour in three Colorado cities. Joined by legendary visual artist SKAM2? (as mentioned in Eminem’s hit song “Stan”), the group will be performing in Colorado Springs, Denver, and Fort Collins. This could be their last time in Colorado as a group, so don’t miss this rare opportunity!